A loyal blog reader sent this to me from a Craigslist ad. What is most worrisome about this error is that they used the word “their” correct two other times IN THE SAME SENTENCE! Again, this is something spell check would not catch, so you need to actually read it (and know the difference between there and their). There is a location or at that place (she was sitting there on the blue chair) and their is belonging to them (he loved riding in their Corvette). And just to be complete, they’re is a contraction for they are. 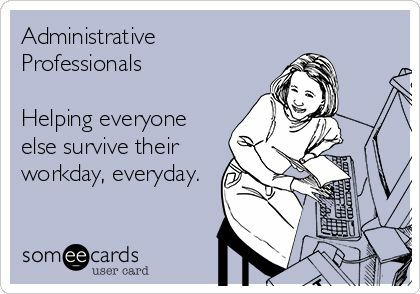 I hope everyone had a great Administrative Professionals Week this week. I found this ecard on Google. Not only is the comma unnecessary, but where you can add the word “single” between every and day, it should be two words and not just one. Here’s a previous article on this very topic – We Appreciate Proofreading Tips Each and Everyday. Grammar Giggle – It’s PAST People, PAST! Comments Off on Grammar Giggle – It’s PAST People, PAST! I found this one on Google. 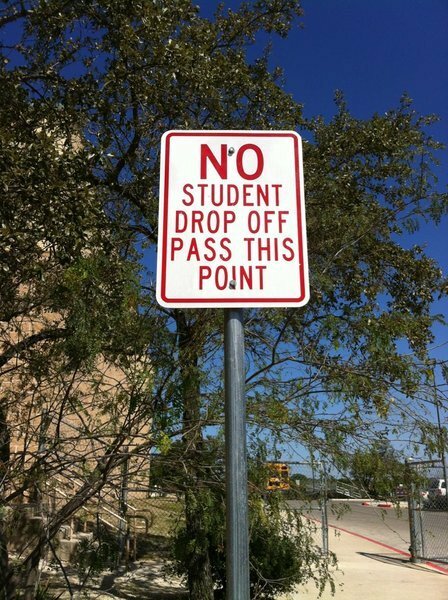 As most of you know, errors by, in, or around schools are one of my biggest pet peeves. I understand that people are working fast and perhaps don’t have the education some others do, but everyone involved in a school is a role model and everything involved in the schooling of our young people needs to be correct. Things like this are inexcusable. Grammar Giggle – Day of the Week is Right, Number is Right, What Could Be Wrong? Comments Off on Grammar Giggle – Day of the Week is Right, Number is Right, What Could Be Wrong? 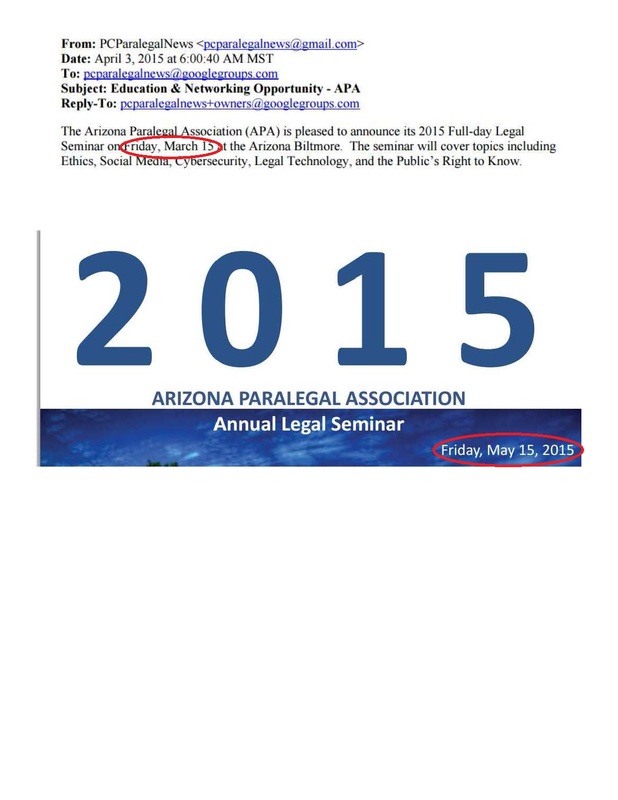 This email was sent to me by a friend who is on a paralegal listserv for our local community college. She thought they were advertising for an event that had already happened. When I was researching it, I found that it hadn’t happened yet. I guess as long as the month starts with an “M,” any month will do. This is an example of the things most people don’t pay attention to that are really important. Will You Favorite the Meme About Global Warming . . . or is it Climate Change? Comments Off on Will You Favorite the Meme About Global Warming . . . or is it Climate Change? Although The Gregg Reference Manual is my style guide of choice (and the grammar resource for NALS’ certification exams), I do enjoy seeing what the other style guides are doing. It could very well be a forecast of changes the other style guides will be making. The new Associated Press Stylebook is in the works and I recently saw an article on the Grammarly Blog about a few interesting changes AP is making in the new edition. The social media terms “favorite” used as a verb and “meme” have been added to the AP Stylebook. To “favorite” something on the Internet is to bookmark the link of a website address so you can return to that page quickly in the future. You have favorited proofthatblog.com, right? 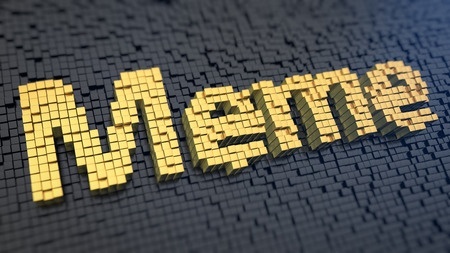 According to Dictionary.com, “meme” is “a cultural item in the form of an image, video, phrase, etc., that is spread via the Internet and often altered in a creative or humorous way.” Examples are the posts of people lying down in public places (called “planking”) and videos of people dancing to the Harlem Shake. Digital posters, on the other hand (which I suspect are the ecards with different sayings using the same image that show up over and over again in your Facebook feed), are not memes (according to Wikipedia) at least “until it reaches approximately the same level of mass recognition as required for a person to be considered a celebrity.” I assume that The Most Interesting Man in the World who started out in the Dos Equis beer commercials and Grumpy Cat “digital posters” are now considered Internet memes. The terms “global warming” and “climate change” are now interchangeable. Although it sometimes makes things difficult trying to keep up and encouraging others to do the same, I love that most style guides stay current with language trends. The English language is ever-changing and it is important that we keep up with the changes. As things continue to change and younger people become our readers, it is incumbent upon us to “speak” through writing in a language that they understand (within reason of course!). Are there things you think should be changed? Leave a comment with your predictions for future style guide updates below. 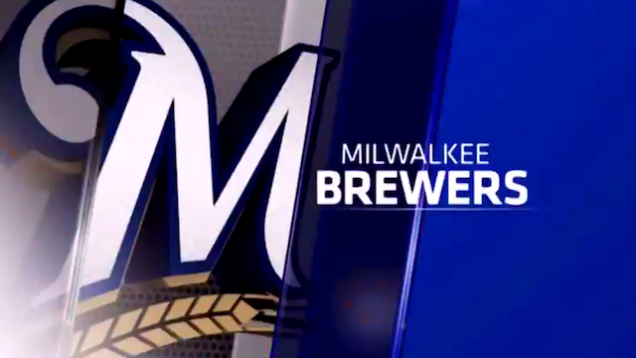 Grammar Giggles – Happy Baseball Season! 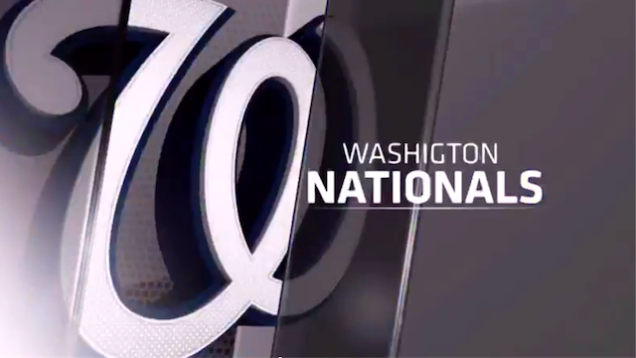 Comments Off on Grammar Giggles – Happy Baseball Season! With the start of the official baseball season last week, these Grammar Giggles are just on time. The first is from my son, who is a Cubs fan and has been his whole life. We spent many a spring training game day at Mesa’s Hohokam Stadium watching his Cubbies. 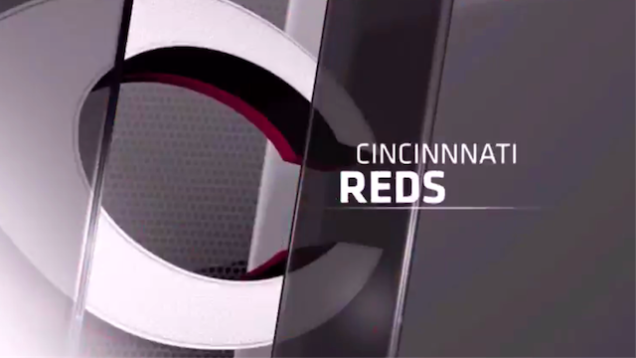 Below are a few of the graphics that were used in the intro package that led into Chicago ABC 7’s broadcast of a recent Cubs game. Looks like you left a letter out here . . .
and replaced a letter here . . .
but added an extra one here . . .
and then there’s this one. San Franscisco? 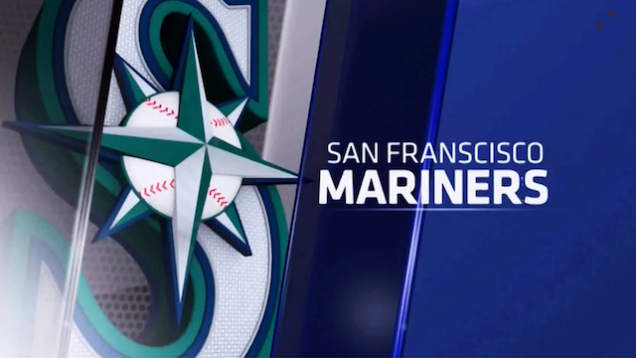 Not only is the name of a major U.S. city misspelled, but I know very little about sports and even I know the Mariners are from Seattle. This is shameful. This was part of a television presentation seen by potentially thousands of people and just goes to show that not a lot of care went into it. The second baseball related Grammar Giggle is from my sister. 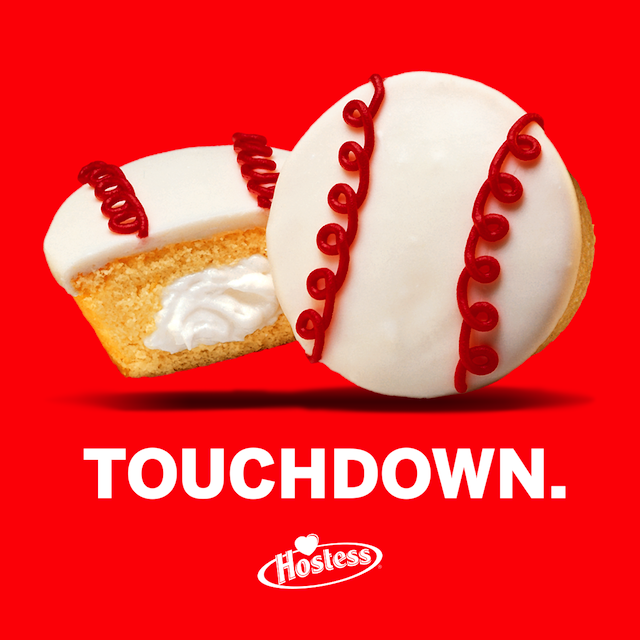 This Hostess ad is just ridiculous. Of course, Hostess claims it was intentional. Their marketing department said “The ‘Touchdown’ line was intentional; it’s fun and aimed at young audiences who are in on the running joke — which, of course, is the goalllll.” Uh . . . riiiiight! 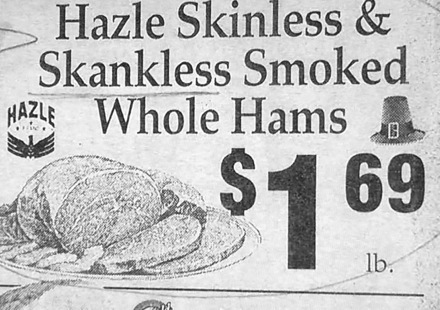 Grammar Giggle – What Kind of Ham? Comments Off on Grammar Giggle – What Kind of Ham? I found this in a Google search for Easter grammar errors. Again, spelled correctly but the VERY wrong word!